The most popular online photo editor in the world! Pixlr Editor is an online image editor that offers not only basic features that can be found in many other similar services, but also a comprehensive suite of professional tools that bring this editor to the usability levels of Adobe Photoshop or GIMP. Amazing free online in browser photo editor! If you have ever used Photoshop, you will be amazed how similar Pixlr Editor is, not only because of its features but also because of its user interface. You can immediately see that Pixlr Editor support many advanced image editing techniques, transformations, layers, filters, rasterization, curve color adjustments, action history, and much, much more. With such powerful tools and intuitive interface, Pixlr Editor represents one of the best web based editors that you can find on modern market. 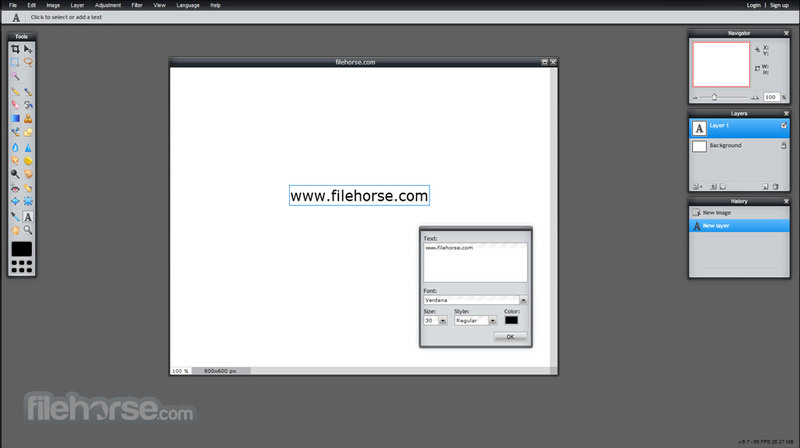 It’s free, does not require installation of any software, and it can be used as a solid alternative to expensive standalone image editing software packages. 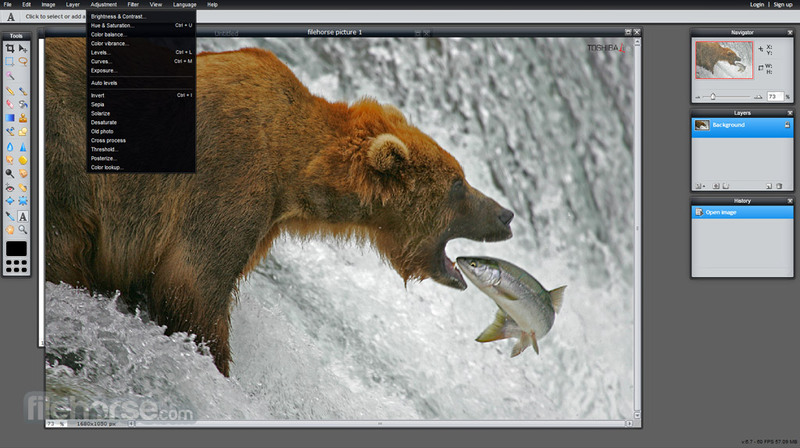 One of the most fully-featured image editors online! 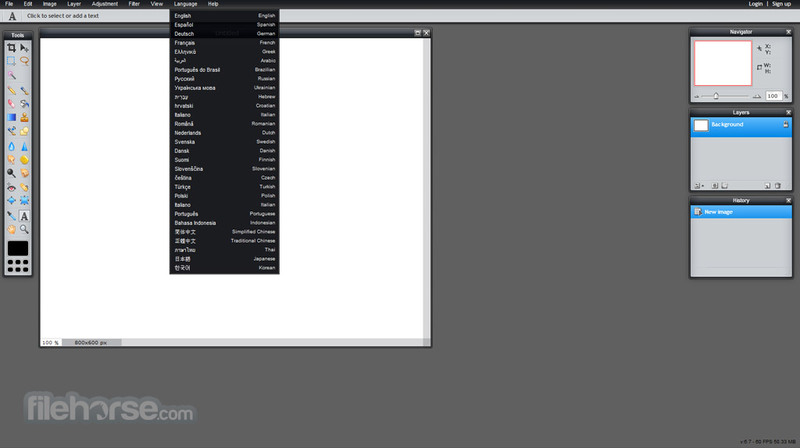 Image editing in web services can be separated in several categories. 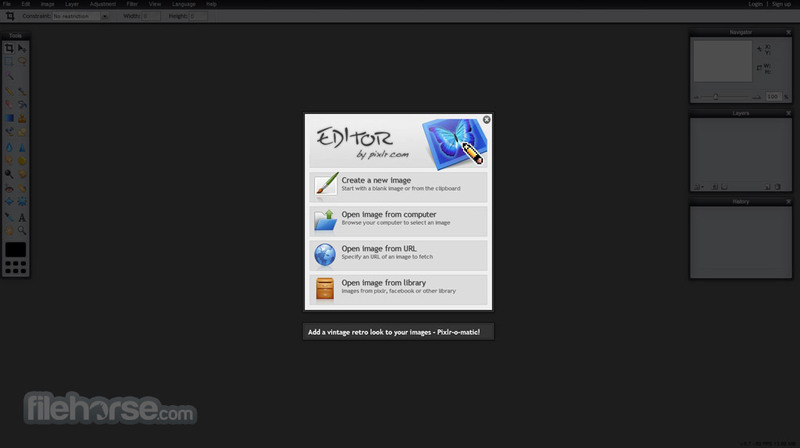 Some webapps are aiming to serve pure novices who just want to throw few filters over their image before sharing them on social networks, some want basic image editing tools, some editors enable large array of tools for basic and medium-level image compositing, and few apps are firmly targeted for professionals who will be willing to pay for industry-leading editors that can be accessed directly from the pages of their internet browsers. However, what if one company tried to mix all those services into one package and offer it for everyone to be used for free? Free online browser photo editor! That company is called Pixlr, and they offer incredible web tools for both novices and professionals that can be accessed from browser from free. 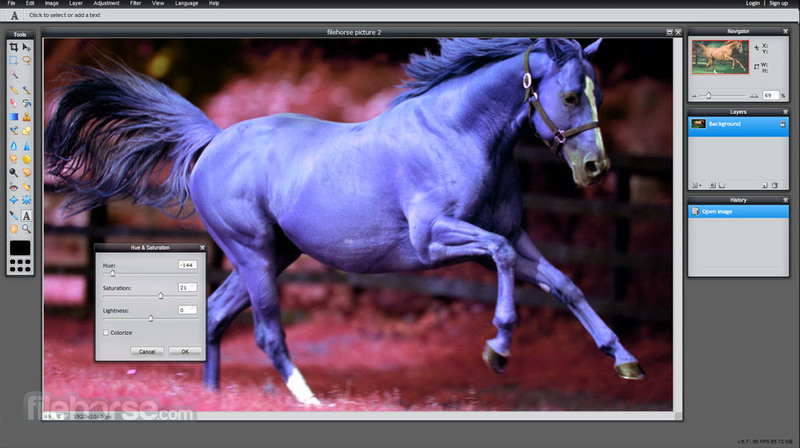 Their central tool is Pixlr Editor, advanced image editor that rivals even the capabilities of industry giant Photoshop. Pixlr Editor is an online editor that does not kid around. From the moment you arrive on its main page you will be welcomed with spotless interface and the choice to start inside your browser tab not only Pixlr Editor, but also two other professional-made app Pixlr Express (for easy manipulation of images captured either from your Webcam or your local storage) and Pixlr O-Matic (for adding fun image effects). After first load of Pixlr Editor in your browser, you will be welcomed with the dashboard that very much resembles the one from Photoshop. After just few seconds of investigating its tools, anyone will realize that his app offers almost everything they will ever need – full assortment of tools, brushes, navigator of colors, history widget, layers selector, and at the top main app tool selectors that are separated into 8 categories – File, Edit, Image, Layer, Adjustment, Filter, View and Language. Simply put, this image editor has the capability to completely eliminate your need for purchasing expensive Photoshop or any other similar professional packages. With Pixlr Editor you can almost every capability of professional solutions, and you can get all that for the incredible price of free. Better yet, this app features no limitations on its service (no unlocks, timers, etc. ), it can work with all most popular image formats, it can load image from your computer, URL and from many online image hosting sites (Facebook, Pixlr), and can directly save images on many popular social networks and image host sites. Free online browser photo editor! Anyone who had any experience with the Photoshop will have no problems easily controlling all fools and services of Pixlr Editor. Entire experience of accessing tools, managing image editing process, and saving your work is placed inside very professional and highly-capable dashboard. This app can serve as an excellent introduction into the ecosystem of Photoshop. Pixlr Editor is 100% free for use, with optional registration process that enables hosting of your images directly on Pixlr servers. Pixlr Editor is focused on professional users who want zero compromises and novices who want to use their browser as a gateway to the image editor that has tremendous amount of capabilities.